This patient presented with Symptomatic Chronic Apical Periodontitis resulting from a necrotic tooth # 19. Our ability to resolve Apical Periodontitis is dependent on our ability to disinfect and seal all aspects of the root canal system. 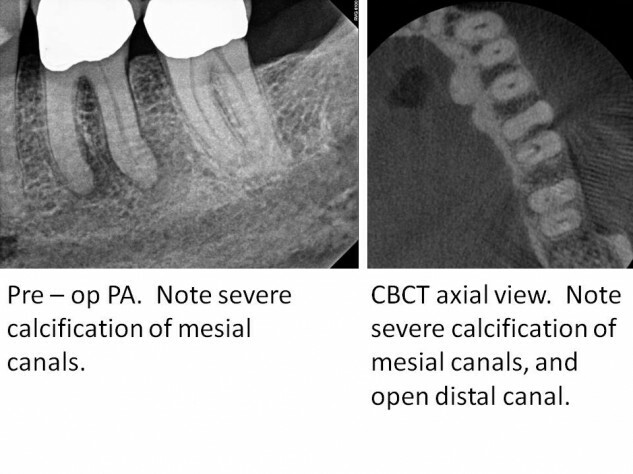 This tooth presented with severe calcification of both the mesio-buccal and mesio-lingual canals, which makes locating and treating these canals particularly challenging. 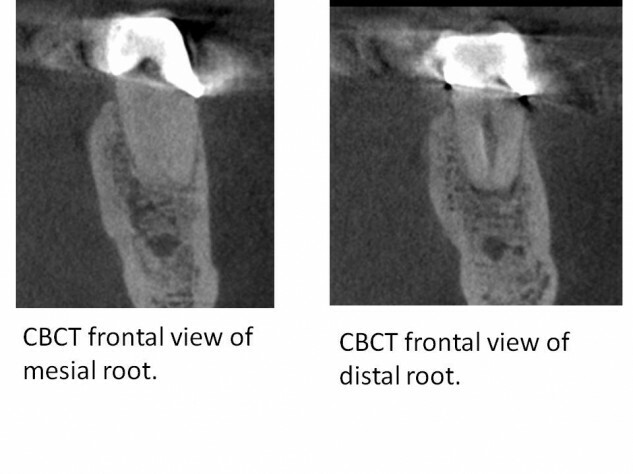 Root canal systems in mesial roots of lower molars are never straight. From the pulp chamber, going apically, the canals begin in the mesial direction and curve around to exit towards the distal in most cases. This curvature makes deep troughing for a patent lumen in a calcified canal risky. Since “drilling” is only possible in a straight line, any specific morphologic information obtainable is critical to decrease the chances of iatrogenic perforation or excessive gouging while attempting to locate canals by troughing deep into the root. Further complicating this case type is the lack of anatomical landmarks. Natural extra-coronal landmarks are lost when prosthetic crowns are fabricated. The intra-pulpal dentin map becomes less useful as troughing continues further down a curved root. 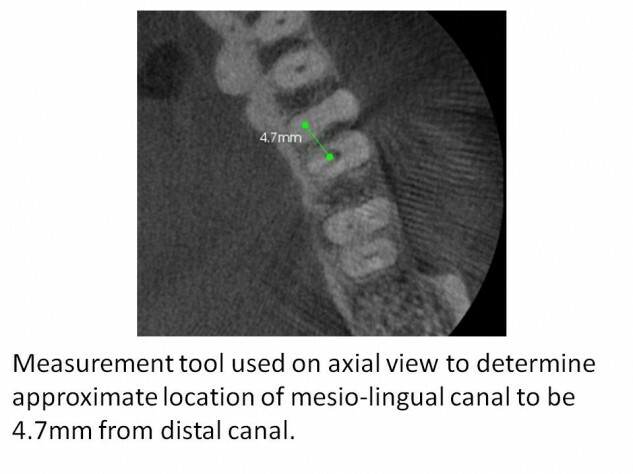 In this case, both pre-operative and inter-operative CBCT scans were indispensable in locating the highly calcified mesial canals. Since the distal canal was easily located, it was used as a landmark to find the others. 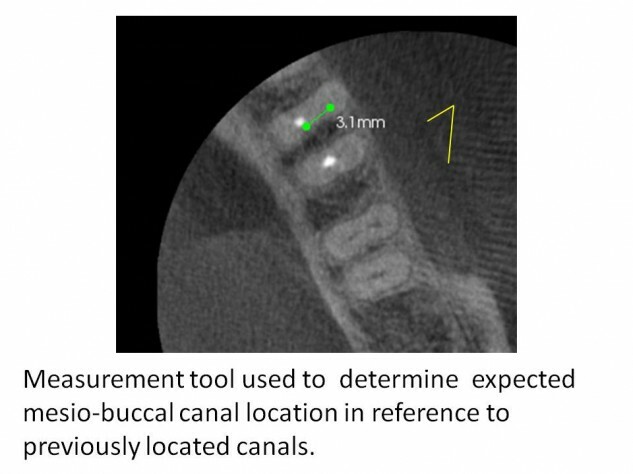 The distance and direction to look for the ML in relation to the D was determined using the CBCT axial view at the first appointment. After locating the ML, and troughing 4mm into the MB to no avail, CaOH2 was placed and an interoperative CBCT was taken. This scan was then used to find the MB canal in relation to the previously located canals and the area already troughed. The crown was removed and a provisional was fabricated during the first appointment. 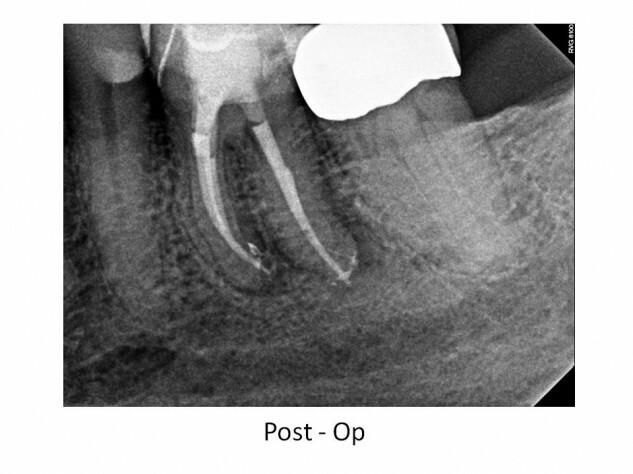 This approach allowed for complete treatment of the root canal system. 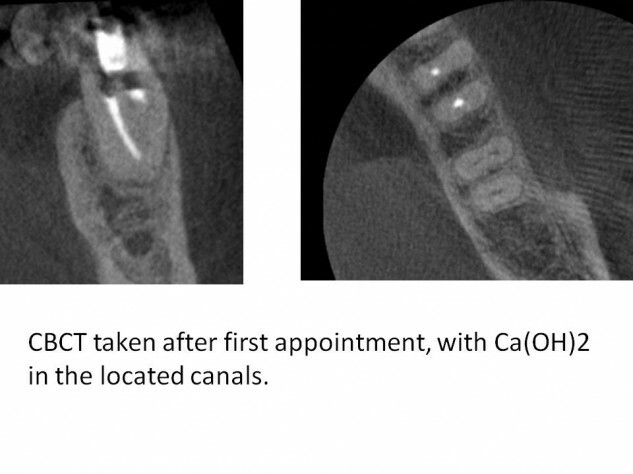 Importantly, the CBCT guided troughing allowed for a conservative removal of tooth structure to locate the calcified canals, which significantly increases the long term prognosis compared to blind drilling and gouging.